Today I got to visit a dairy operation which is pretty big business in Norway. We toured the Smestad farm. 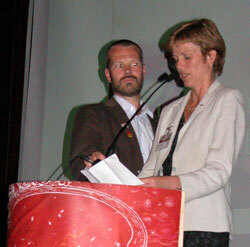 Pictured here are our hosts, Ole Kristian and Randi Skallerud. The interesting part of the dairy is that they’re using an automatic milking system from DeLaval. So before we event went into the barn we learned more about robotic milking. At our opening night reception and dinner we heard from the CEO/President of Tine, the Norway dairy cooperative that makes Jarlsberg cheese. This year is the 50th year since they began making this great cheese. 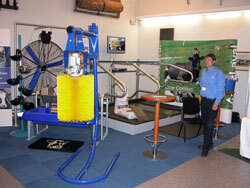 One of the exhibitors here at the IFAJ Congress in Hamar, Norway is DeLaval. 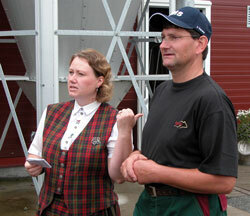 DeLaval is represented by several people like Mr. DeLaval Norway, pictured here. 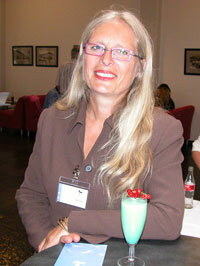 However, I interviewed Barbara Strunk who works for DeLaval in Germany. One of the first people I interviewed here in Norway at the IFAJ Congress is involved in milking horses. This is not something I’m familiar with. Maybe you are. An up-front dialogue between the nutritionist and custom cutter can pay dividends, says Dr. Bill Mahanna, coordinator of global nutritional sciences for Pioneer Hi-Bred. A nutritionist’s ration plans can change year-to-year, so variables such as length of chop and degree of processing should be adjusted accordingly. If the nutritionist shows desirable corn silage samples to the custom cutter and clarifies needs in advance, it diminishes subjectivity and improves everyone’s satisfaction. Bill has suggestions for encouraging this face-to-face planning. Listen to them and tell Bill your experiences. Ohio is well known among State Departments of Agriculture for its Livestock Environmental Permitting Program – it is one of the most well regulated state programs in the country, permitting and inspecting over 157 large livestock operations in a state with a very tight rural-urban interface. These facilities, in the case of dairy, are larger than 700 animal units, and require a permit to build facilities, and a permit to operate once constructed. For the past year, ODA has been defending the program from an appeal waged by Citizens Against Megafarm Dairy Development before the Environmental Review Appeals Commision. Should the cost of purchasing corn silage be driven by quantity or quality? Dr. Bill Mahanna, coordinator of global nutritional sciences for Pioneer Hi-Bred, believes in retiring the 30-year-old rule of thumb, the Board of Trade price for corn times six or seven. Current lab methods and credible indexes are more accurate in determining relative values to dairy operators and fairly compensating silage growers. Bill details various pricing opportunities in a spreadsheet, which he’s willing to share. For a copy, e-mail him at bill.mahanna@pioneer.com. The last item on the agenda here at the Cattle Industry Summer Conference in Reno is the board meeting which is going on now. It’s a combined meeting of the Beef Board and NCBA. I thought you might be interested to hear a great report given this morning by Beef Board Chief Operating Officer Monte Reese was on the program at this morning’s board meeting to give a report on the activities of the Checkoff. I don’t know how many dairy producers are members of the National Cattlemen’s Beef Association but I thought you might be interested to hear from the President. He’s Mike John, from Missouri (left). 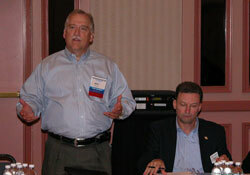 Mike took over the reigns in January at the annual convention. Here at the Summer Conference he said he was happy to hear about how beef demand has been good recently but knows that there’s a lot of work to do to continue to grow demand for his product. 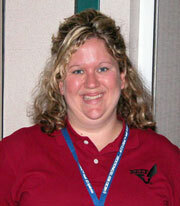 Tracey Orsburn is one of the Beefmobile Wranglers and is here at the Cattle Industry Summer Conference. She puts in a lot of miles travelling around the country and making sure producers better understand the Checkoff. Her vehicle is also a travelling billboard for beef.